This is the basic coop. It was constructed in the Stonehorse Farm workshop of cypress, and machined from rough 8/4 material. 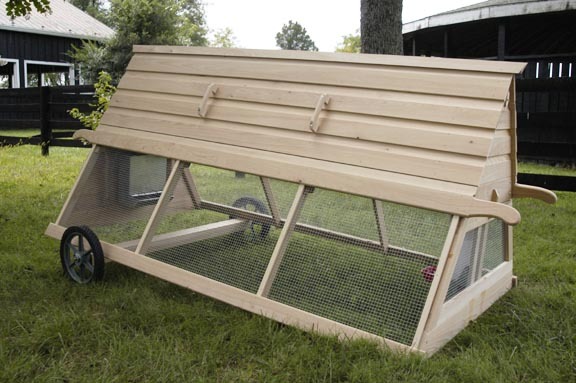 This coop is sized for eight chickens and can be easily moved by two people using the handles at each end. A wheel unit shown below makes for easy transportation by a single person. 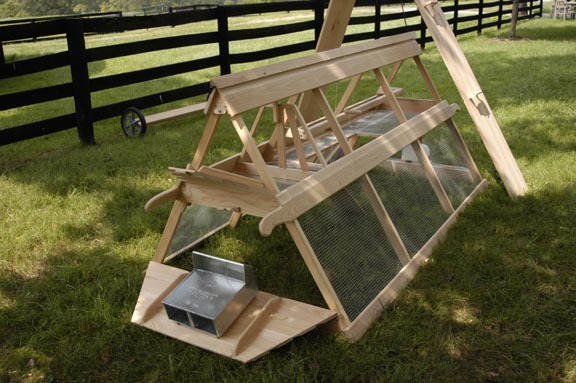 The coop weighs just under 40 pounds - which puts it in the ultra-light category thanks to the light but strong characteristics of the cypress wood and the "rib and skin" construction techniques borrowed from the small boat building craft. In addition, cypress stands up to weather about as well as cedar or teak. 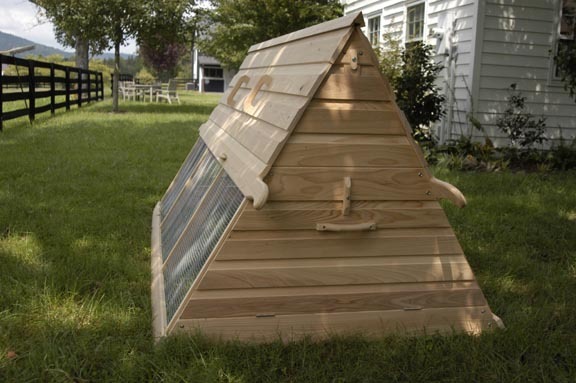 After looking at the rather expensive imported chicken coop, David decided he could build instead of buy. The project required about $300 in materials, 60 hours, and $40,000 worth of European woodworking machinery to complete. 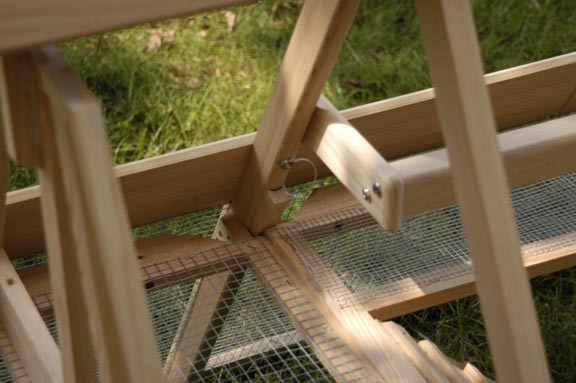 The coop has removable end and side panels to facilitate cleaning. A large removable feed bin is at one end on the lower level, and a watering unit at the opposite end as shown in the photo on the right. Shown above is the "nesting" end of the upper level where the chickens lay eggs. The panel at the end swings down for gathering the morning hatch. 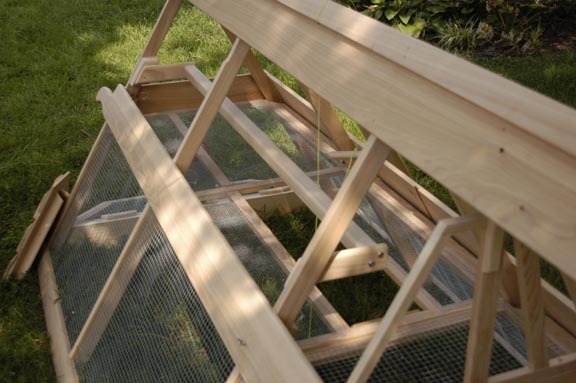 Also shown is the stair that can be raised by a cord from outside the coop. The chickens retreat to the upper level to roost at night. The stair can be pulled up to keep them above so the unit can be moved to a new location the next morning. The upper level floor drops out for cleaning after removing four wedges. The detail above shows one of the four wedges securing the floor. The photo above shows the roosting bar where the chickens idle away the dark hours of the night. 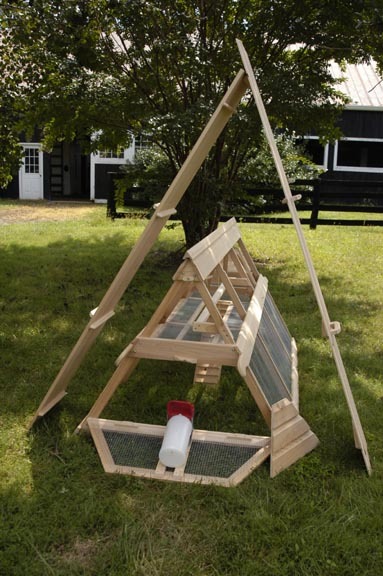 This is the wheel unit that can be put under the coop to make for easy transport to a new location by a single person. 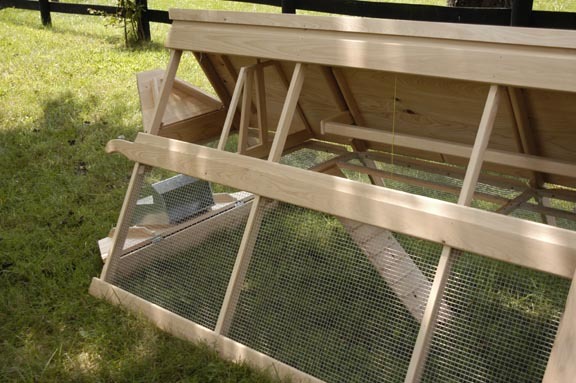 To keep the chickens from digging up the grass and to keep predators from digging in, the coop sits on a welded wire panel that simply lays on the ground. The panel is moved from location to location along with the coop. And here are the Stonehorse Farm chickens - an exotic mix of six specialty breeds - enjoying their new coop. These chickens were hatched from eggs provided my McMurray Hatchery. The eggs were delivered to Stonehorse Farm on May 27, incubation started on May 31, 2003 and the chicks hatched on June 23. The crested black chicken is a rooster. All others appear to be hens. 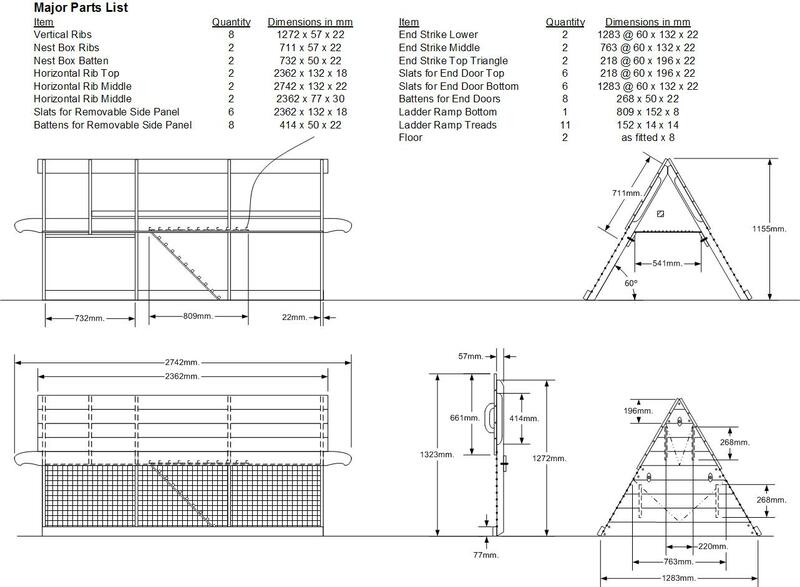 The basic construction diagram is below - for those who are interested in such detail.